I meant to have this post up muchos earlier today.. but then I was looking it over.. I just wasn't overly thrilled with the nails. So, I decided to watch a random horror flick via netflix. Near the end of this sad horror flick, I was looking beyond the characters at the wallpaper behind them. And it hit me: the bloody wallpaper look needed cheery wallpaper with blood splatters, duh! I have to say, I did love my other Bloody Wallpaper look (see it HERE), but this.. this is more disturbing in my eyes.. because it seems like it should be so cheery, and then oh hey, blood! I think my tip for anyone wanting to do Halloween nails, but doesn't really know what to do, or doesn't have a wealth of time on their hands.. grab a straw, grab some red polish or paint, and go to town - even over your existing mani.. 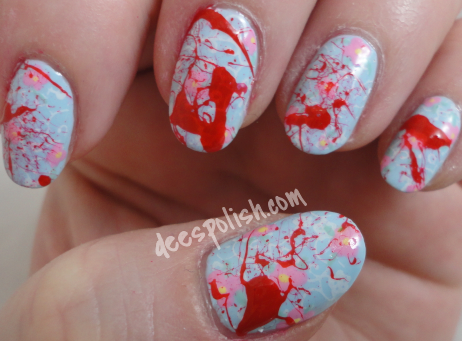 Blood splatter makes anything seem a tad creepy.. and I want to keep Halloween creepy! Enjoy -- see you all tomorrow! !